Full-Service Internet Company | Questions? We create, design and build powerful websites and webshops that contribute to your online succes. From a full-service approach we can build or optimize every imaginable type of website, which is easy for you to manage. Of course we always ensure that the website is responsive and SEO friendly. After delivering your website you can choose for a maintanance subscription. With this subsciption we make sure your website continuously uses the latest security updates and you can always contact us if you want to change something or if you have any questions! All websites and webshops made by 4 real solutions are responsive. 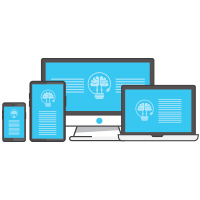 Responsive means that your website appears optimally on both desktops, laptops, tablets, smartphones and other mobile devices. The content (texts & images) fits neatly within the width of the screen. With a responsive website or responsive webshop you ensure an excellent user experience on any device. We also take Cross-Browsing into account . This means we make sure that the website works well in different browsers such as Chrome, Internet Explorer, Safari and Firefox. You want a new website or webshop and have certain ideas about this. Together we will discuss the goals, wishes and possibilities for the project. Furthermore, we speak about the domain name, Web hosting and the style for the website. We explain you how the project will proceed and within a few days we will send you a quote. This phase is free and does not obligate you to anything. After receiving your agreement on our offer, you will receive an invoice for a deposit of 50% of the total amount as agreed in the offer. We would now like to receive the materials that may be posted on the website. To do this, you will receive a specified overview in which we explain what we expect to receive and how you can send it to us. For material you can think of: a logo, the color scheme for the website, product information (for webshops), texts and images, such as photos and videos. If desired we can help you with this phase. We can design your logo and branding and support you in finding suitable images for the website. From the moment we have received all the necessary material we start with the design and content of your website. We do this in a test environment that is only accessible with a password which you will receive in the next stage. Our commitment is to complete the design phase within 15 working days, depending on the size of the project. Of course we inform you promptly so you know what to expect. Perhaps the most important phase of the project. The website is now ready to be tested. There is enough room for adjustments, just as long until you are satisfied. Take the time to review all pages of the website and verify that everything is working properly. You can ask your customers and/or acquaintances to review the website, preferably on different devices (desktop, laptop, smartphone etc. ), in order to detect any improvements and flaws. Are you completely satisfied? Then you’ll receive our invoice with the remaining due and we can move on to the next stage: the delivery of the website! As soon as the last changes are made, the website is completed and you have paid the invoice, it’s time to go online! When you have contracted a webhosting package with us, the contract period will start from this moment. The website is transferred from the test environment to your domain name and is now accessible to the rest of the world. We register your website with the major search engines to ensure your customers can find you as soon as possible. The website is now live and running but should be updated regularly in order to ensure the continuity and security of the website. Of course we help you and we ensure that there is always a recent backup available. This phase is part of an optional maintenance contract. If you prefer to do this yourself we will send you a manual with basic information about how to update the system. Interested in a quote without any compromises? Contact us for an orientation meeting! © 2017 | 4 real solutions | All Rights Reserved. All prices are excluding VAT. Private accounts within the European Union pay 21% VAT. Business accounts outside the Netherlands but within the EU and all customers outside the EU will not be charged with VAT.